While there are many books about the study of dance on the market, there are very few that share such a personal, riveting story of a dancer’s journey combined with the life lessons she then applied to her own teaching. Dancing Feat unquestionably sets the bar high, as author Eveline Carle shares her story starting at the age of 7 when her brother died, her mother left, and she found herself living in an Ashram in New York after her father kicked her out of their family home. The book is a story about Eveline’s journey through ballet school in Montreal, Canada; dancing with the national dance company; and moving to the US where she then choreographed 100’s of works, performing live in theater and in film. Author Eveline Carle’s personal mission is to teach her students a greater sense of self-esteem through the study of dance. 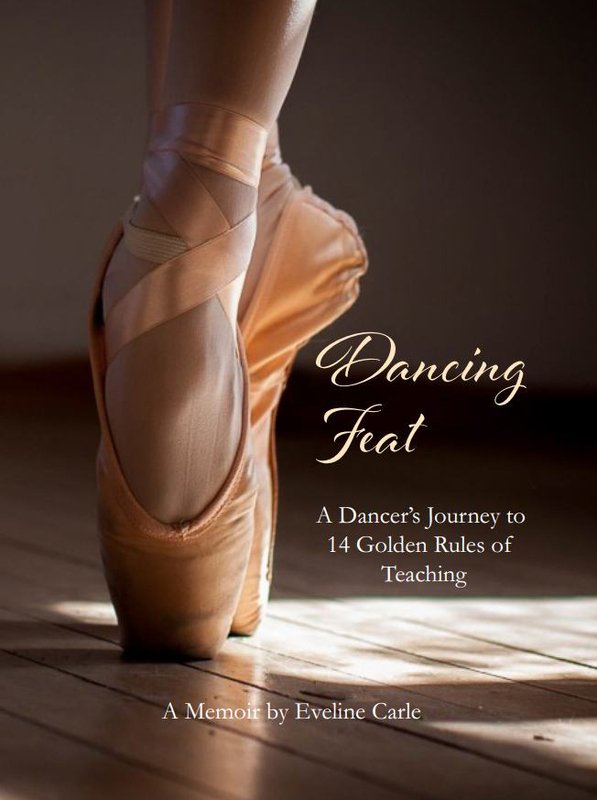 The 14 Golden Rules outlined in each chapter of the book are applicable and empowering to all, dancers or not; to name a few included are “dance training is a path not a leap”, “learn by teaching others”, and “build self-esteem, not egos.” In the book, author Eveline Carle talks about the importance of learning to follow our own pace when it comes achieving goals. The conclusion reflects on self-acceptance and the importance of accepting all parts of ourselves. Dancing Feat is available for sale on http://evelinecarle.com/books/ and Amazon, and was celebrated at a highly-attended book launch party earlier this month. The book is already being raved about as a must-have gift for dancers and their parents this holiday season. Dancing Feat is about author Eveline Carle’s path as a dancer and how she aspired to make dance education something sacred that could make a difference in young people’s lives, which took many years for her to complete. Eveline Carle is available to answer any questions about her new book, as well as future and current programs at the Cape Cod Dance Center. and operates the Cape Cod Dance Center, providing a well-rounded education and artistic inspiration while helping students find a greater sense of self-esteem through the study of dance. Cape Cod Dance Center teaches a variety of disciplines including ballroom dancing, classic ballet, contemporary dance, jazz, tap, lyrical, hip hop, yoga and wellness; all taught by dance professionals with years of experience. For more information on Dancing Feat, to purchase the book or attend the launch party, please visit http://evelinecarle.com/books/.